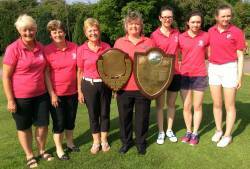 General Club Noticeboard : Ladies Sweep Up! Our Ladies cleaned up at the recent County Shield event at Scraptoft Golf Club run by the Leicestershire & Rutland County Ladies Golf Association. Our team of Lianna Bailey, Annabel Bailey and Jessica Bailey won the Scratch Shield. Our team of Julie Dawson, Jenny Carter and Anne Eastham won the Handicap Shield. Both teams are pictured above with the Ladies Captain.And if that wasn’t enough, Lianna Bailey won the Ellis Trophy for the best gross score of the day. Well done and many congratulations to all involved.